I couldn't resist but to share with you this antique store find. I was visiting Ipswich the other week for a day of shopping with Mum. There are loads of fantastic antique stores, homewares and handmade gift shops dotted around the historic town, and while at the Ipswich Antique Centre on Roderick St I spotted this delightful necklace pendant. 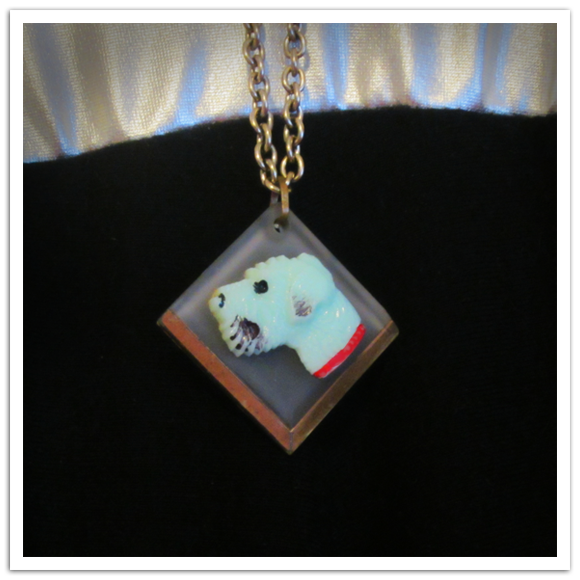 It has a mint-coloured bakelite doggy head mounted on a square of glass that has a gold trimming! Isn't it unusual?